Lovers of "la dolce vita," take note: The new Perugia International Film Festival will launch its first annual Festival from March 22nd to 25th, 2012. As a non-competitive festival, the Perugia International Film Festival aims to present groundbreaking films while also celebrating the art and the craft of cinema, and sharing the beauty of the city itself. Set in Umbria’s picturesque hills—“the green heart of Italy”—Perugia is home to two leading universities, extraordinary Umbrian architecture, and a rich artistic and cultural heritage from Etruscan times to the Middle Ages and the Renaissance. The Festival draws inspiration form the city’s historical narrative, paying tribute while creating a framework for innovation. A different kind of festival, it is an idyllic forum for original thinkers and visionaries to start conversations, generate new ideas, and immerse themselves in all artistic genres. The Perugia International Film Festival will present films that exemplify traditions of craftsmanship as well as of aesthetic and technological innovation. An annual focus of the Festival will be to honor the work of the masters behind Costume Design and Production Design - integral, but rarely recognized, disciplines. In addition, the Festival intends to celebrate recent developments in film preservation and will showcase newly restored award-winning films. Moderated discussions and panels will present audiences with an opportunity for an immersive experience in all aspects filmmaking. "Perugia is the perfect location for an international film festival where there can be an opportunity for a lively exchange on the possibilities of the medium of cinema,” says Paul Feller, Chief Executive Officer, Stratus Media Group, which conceived the idea for the festival, and is producing the event. “Perugia is not only one of the most breath-taking Italian hill towns with a history of artistic achievement and culinary tradition," remarks Festival Director Karen Arikian (photo at left), "it is also the dynamic home of two internationally renowned universities and a number of significant festivals. 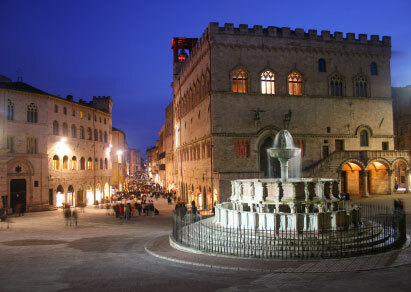 That makes Perugia a very youthful city, but one with an incredible artistic heritage. We intend to work with local as well as international institutions to provide a broad platform for the Festival to grow."